As the operations manager of a facility, you are likely very concerned with how your clients perceive your business. From the cleanliness of your lobby to how the client is treated, you want to ensure that your customers have a positive experience from start to finish. Luckily, mat rentals are an affordable way to improve your facility and make it more attractive and comfortable for clients and employees alike. Learn more about the benefits of mat rentals in today’s blog, below. Mat rental offers many benefits for any facility. Did you know that businesses spend more than $70 billion every year on slip and fall accidents? In fact, the total cost of a single fall accident comes to a whopping $20,000! This is why it’s so important to focus on preventing falls in the first place, and anti-slip mats are the perfect place to start. Mat rentals are affordable and effective in preventing falls on slippery surfaces such as tile, hardwood, and laminate floors. By placing mats in entryways and highly trafficked areas, you can go a long way in preventing the possibility of a dangerous (and potentially costly) accident. 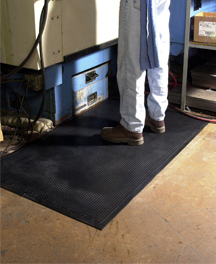 In addition to preventing falls, entryway mats are also an effective way to cut down on the amount of dirt and grime that enters your facility. Entryway mats can cut dirt by more than 80%, which means you can spend less time and money on cleaning and more time focused on helping your customers. From restaurants to car dealerships to hotels, if a business has a non-carpeted floor then it will benefit from the addition of a non-slip mat. When combined with an outdoor scraper mat, you’ll not only prevent spills, but you’ll also greatly cut down on your cleaning needs as well. Be sure to check out our new mat site! Want a FREE Mat Rental Quote? Click Here! To learn more about ordering your custom logo mat, please contact Joe Bateman at Lord Baltimore by calling 800-292-1224. This entry was posted on Thursday, April 28th, 2016	at 9:27 am	. You can follow any responses to this entry through the RSS 2.0	feed. Both comments and pings are currently closed.